Vacation rental villa. Sleeps 8, 3 bedrooms, 3.5 bathrooms. Dogs allowed. You will find everything you need to settle in and relax right here. This fully updated kitchen is amazing, they thought of every detail for families who love to cook at home on vacation. The open floor plan allows for easy entertaining or family time while preparing meals. In the living room you will find new, comfortable seating and a large flat screen television. The second floor has one master bedroom with a king size bed, ample closet space and a beautiful view. All of the bedrooms have an ensuite bath with a shower/tub and a private balcony. The second bedroom has two twin beds. The third bedroom is another master with a queen size bed and shares the third floor with the loft bedroom. This room would be great for kids, with bunkbeds and a clubhouse hangout feel. 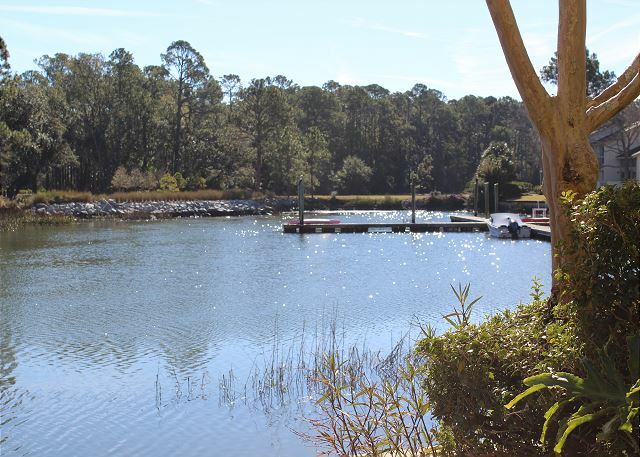 Come and enjoy the peace and quite of the cove, wander a short walk to the beach or head over to the South Beach Marina, home of the Salty Dog Cafe and many other island activities. All vehicles require gate access. All passes will be mailed to the address on the reservation time permitting. If mailing is not possible, there will be a one time cost of $8.00 per vehicle to gain entry into Sea Pines Plantation.